EN 60546-1 ed. 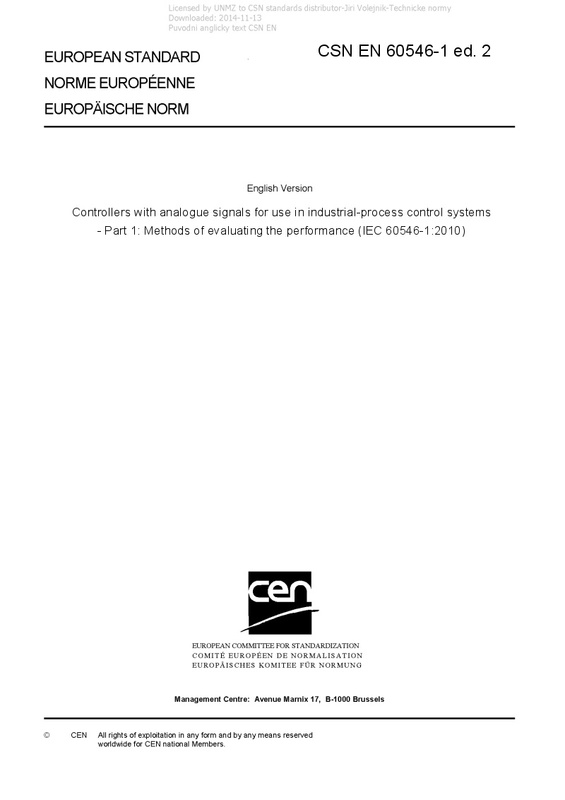 2 Controllers with analogue signals for use in industrial-process control systems - Part 1: Methods of evaluating the performance (IEC 60546-1:2010) - IEC 60546-1:2010 is intended to specify uniform methods of test for evaluating the performance of industrial-process PID controllers with analogue input and output signals. The test conditions specified in this standard, for example the range of ambient temperatures, power supply, etc., are used when no other values are agreed upon by the manufacturer and the user. This third edition cancels and replaces the second edition, published in 1987 and constitutes a minor technical revision made to bring terms, measurement units and references up to date.